What is IPTV - IPTV is the sending of television signals through packet data networks that use IP addressing (the data network itself does not need to be IP based). IPTV Services - IPTV services are a mix of traditional and new television and multimedia services. IPTV systems normally start by offering similar programs to cable tv and then quickly add thousands of new programs from around the world. IPTV services can include two-way TV (community TV), interactive ads, and television stores..
IPTV Viewing Devices - IPTV systems may be setup to allow viewing IPTV programs on traditional (TV) and other types of devices (such as multimedia PCs and mobile telephones). IP Video - IP video is the sending of moving pictures over packet data communication systems. IP video involves converting video (analog or digital) into packet data form. IP video has some significant differences from broadcast digital video. IP Audio - IP audio is the sending of sound signals over packet data communication systems. IP audio involves converting audio (analog or digital) into packet data form. IP audio has some significant differences from broadcast digital audio. MPEG - MPEG is a system that allows for the mixing, transmission, and controlling video, audio, and data so the user can have a TV like+ experience. IPTV Systems - IPTV systems are the combination of media and communication equipment with software programs (such as middleware and rights protection software). Home Media Networks - Getting the signals around the house. IPTV Security - IPTV systems are usually designed to control service rights and protect content. Without a good content protection system, content owners may not allow distribution of their programs (movies and shows) through the IPTV system. 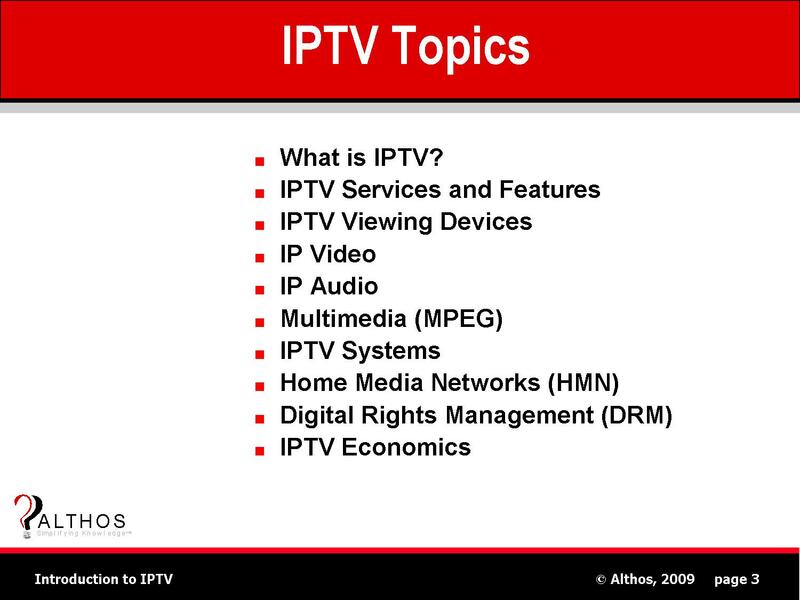 IPTV Economics - IPTV economics is the revenue sources and the associated costs for an IPTV system operator. In 2009, many systems have a cable TV look alike business model which may be unprofitable. New features and revenue sources for IPTV systems will allow operators to shift to targeted advertising and television commerce systems resulting in a windfall profit for some successful companies. This book explains how to provide television services over IP data networks. IPTV video technology is explained including video compression, audio compression and IP multimedia transmission. The functional parts of IPTV systems are described along with their operation and the key protocols that are used to manage IPTV networks.